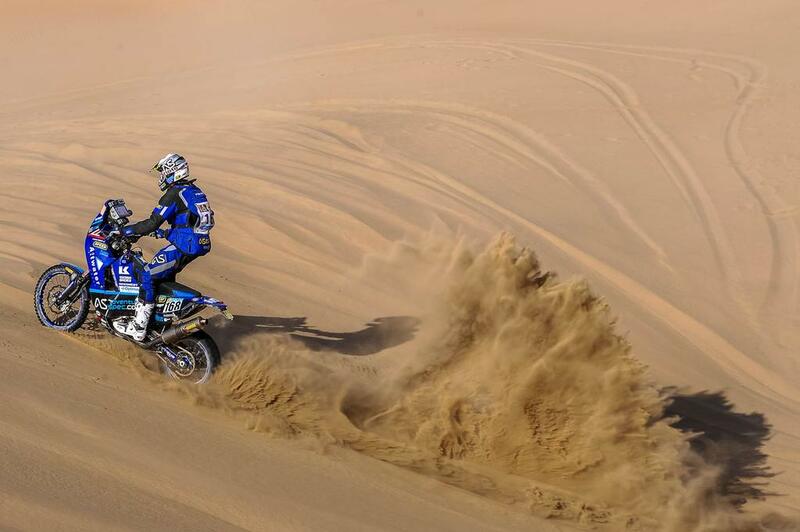 Lyndon Poskitt experienced first hand the challenges of the Dakar after a highly eventful stage 11 saw him have to cope with potential race ending technical problems. The 34 year old Brit realised 30km into the 392km timed special that his front mudguard was loose and that his front brake had stopped working. Poskitt explained. “When I stopped to work out what was going on I could see oil dripping and realised that the bottom of the fork leg had cracked in half. I knew straight away that it could be the end of my Dakar. I contemplated riding the rest of the stage with no front brake and no damping in one fork leg before making the decision to try and fix it. I got the fork leg off to try and save some oil and then I cleaned up where it had broken the best I could before mixing up some plastic metal , putting it back together and using three heavy duty zip ties to hold it all together. I had to wait for about 30 minutes for the liquid metal to go off and once it did I got going again. By the time he’s fixed his bike, Poskitt was the last rider on the stage but managed to reclaim a significant amount of positions. He ended the day in 87th place which leaves him 52nd overall.